XCEL, JO and POWER TUMBLING will be CANCELED those days and we’ll also be CLOSED FRIDAY MAY 25TH. I figure everyone would like to get an early start on there vacation and it’s the last day of school. Jiu Jitsu class is NOT canceled. NEW Summer schedule will begin on May 29th. I hope this works better for everyone schedule. Thank you for your input! I’m a little late getting this out. I started it at the beginning of the month and just now realized I didn’t post it. Please read this for all the upcoming stuff (which is a lot) for all the changes for summer that are happening. Thanks! Our Xcel team wrapped up there competition season doing there best. It was enough for a few of the girls to take first place on there events and for the rest of them to feel like they improved on there skills. Our Junior Olympic team is well on there way kicking off the season with a bang at the Arete Gymnastics competition. You can check out more pictures on my facebook. Just type in my name, Carrie Mann, and look me up. I’ve also put up the Xcel routines from floor on You Tube. I will post JO team videos as our season progresses. PRICES will change for the new season. We are still the most least expensive gym in the state even with our new prices. Please look at how the other gyms are priced to see how fair we are with our tuition if you are wondering. Remember that when our rates go up we can afford to do more for the kids. I hope you’ve noticed the improvements this year to the facility and the equipment with the new tramp pads, quad bar set, beam pads and more. We will always continue to improve and do more with your support. Thank you! Prices are posted on our website under “weekly schedule” and will also be in a reminder email at the end of May. Last year, for the summer, I allowed you to take a week’s worth of tuition off for one of your months if you took a vacation. A lot of people think they should take the whole summer off because you take vacations and don’t want to pay for gymnastics while you are away. Well, now you get a break! Please notify me before you take your vacation so I can apply your ONE WEEK DISCOUNT on whatever class your child participates in. Don’t let vacations be an excuse to not keep your child active this summer. Kids need an outlet and something to progress in even through the busy summer. For Level 1, Level 2, Level 3, and tops gymnasts SATURDAY MAY 26TH. This will be instead of our parents day. There is a $10.00 participation fee (pays for the awards and extra coaching that day). 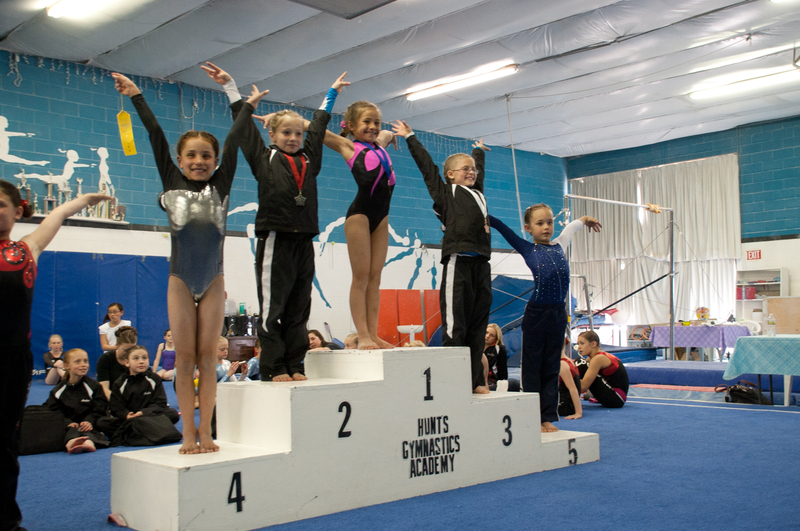 Alisi (from our JO Team), 1st place vault at Hunt's Gymnastics. Please have your athletes in a nice leotard with tight shorts (no underwear hanging out please). Hair nicely pulled back and completely out of the eyes. Please be on time so we can stay on schedule. Also, please let me know if you will not be participating. We do incourage that everyone attend so you can see your child perform and receive awards. If your child is level 1 and very shy about performing, that’s ok, but please have them come and watch so they know what to expect for the next time we do this. This will only help them in the long run. Thank you! 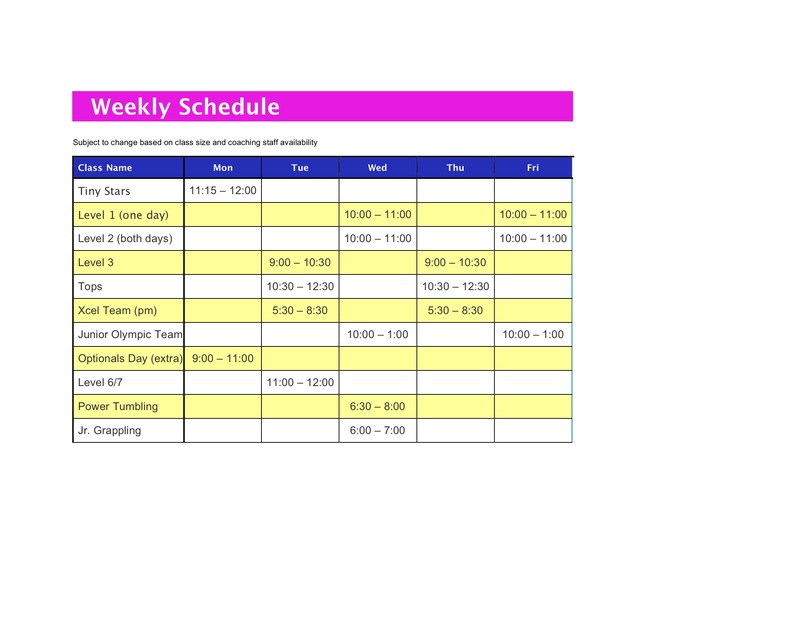 The summer schedule is available on our website under “weekly schedule” at all times. But I posted it here as well. Please look at our schedule. It will be begin MAY 30TH. You will be receiving an invitation from me to participate in any new classes. I will be emailing you the week before the inner squad meet to tell you if you’ve moved up to the next level or not. It will depend on your childs participation in the class, knowledge of there skills at that level and skill set. We want your child to feel accomplished in the level they are placed in and we take careful consideration when placing them. If you do not receive a letter, please contact me. It means that I mis-placed you or you don’t have an email. It is a special honor to be invited to the next level in our gym. So please express that excitement with your children about moving up. I know the cost may be more, but you will get more of the benefit of gymnastics the longer your child stays and the more hours they are in the gym. Gymnastics is so tough and takes lots of time and dedication to be good at it. Three to five years of gymnastics is the recommended amount of time for a child to feel the full benefit of it. I took for 10 years and I still thank my mother for her sacrifice! Several of my team girls this week have shared a fun story with me. In Koosharem they have a teacher that has challenged them in a one mile run. The teacher said, “if you can beat me, I’ll give you a reward” I can’t remember what the reward was, I apologize for missing this information. So a lot of the kids in the school have raced there teacher (who does marathons) and tried really hard to pass her up. Three of our team girls have beat the teacher and non of the other kids in the school have to my knowledge. Stories like this just confirm my belief that if you do gymnastics, you’ll be great at any sport you try. I know I was when I was a kid. I could run faster, lift heavier weights and play any ball sport better than 95 percent of the kids at school. It was such a great confidence builder and has done so much for making my life better. Not only that, I face challenges head on, have confidence, love working with people and being an inspiration to others. Even now as an adult, I know how to take care of my body and have a bigger advantage to staying fit because I developed more muscle fiber as a child as well as all the education on how to do it. Who wouldn’t want that for their children? Receive $15.00 off your tuition for the month you refer someone to our program this summer. It’s only good for the three months of summer. The referred person must be signed up for at least a month to receive this discount. Your class day and time will stay the same through the summer. We hope to keep this class going all year around. Last year we had too many drop off and had to cancel. That broke a few boys hearts. So please let us know what your plans are for the summer. All the same referral programs and summer vacation discounts apply to you as well. We will be doing a belt test at the end of May before school gets out. So please be prepared to hear about it when the boys come home exited. Thanks everyone! I see you parents all the time but if you’re hubbies or grandparents want to come watch the third week in May, I’d love to show off to them a little. Check the schedule for you’re new class time. I’m putting the class together for the summer unless we have too many in one class, then I will break it up again into two classes. If enough boys are staying for the summer, I will provide a class. Please inform me if you are so I can figure out what to do with the schedule. If I only have a few boys, I will incorporate them into our power tumbling program at night on Thursdays. It will be for a longer time but will be good for the boys to get there energy out during the summer. Ahh.. finally, I think I’ve said it all. I hope I haven’t forgotten to tell you anything. If you have any questions please come find me at the gym, call me, or email me anytime! I look forward to a great summer!